Defends your roses against insects, diseases and mites. Do not add adjuvants (spreaders, stickers, extenders, etc.) 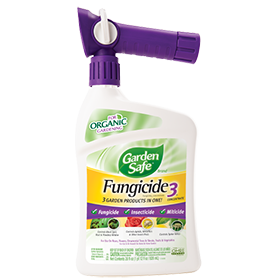 to Garden Safe® Brand Fungicide3® Concentrate. Do not apply to wilted or otherwise stressed plants, or to newly transplanted materials prior to root establishment. May also be used as a dormant or delayed dormant spray to control overwintering eggs of various insects on fruit and shade trees, shrubs, roses, and other ornamentals and vegetables. Spray to visibly wet or until all plant surfaces are completely wet. Do not apply to known sensitive plant species, such as impatiens flowers, fuchsia flowers, hibiscus flowers, some rose flowers, ornamental olive trees, or some carnation varieties without prior testing. As with other oil-based products, exercise care in timing applications to early morning/late evening to minimize the potential for leaf burn. Use with care on plants with tender tissue. Check for leaf burn in small scale trials prior to use. Can be used as a leaf polish on hardy plants. Application Instructions: Garden Safe Brand Fungicide3 Concentrate is an effective fungicide for the prevention and control of various fungal diseases including powdery mildew, black spot, downy mildew, anthracnose, rust, leaf spot, botrytis, needle rust, scab and flower, twig and tip blight, and alternaria. As a preventative, apply Garden Safe Brand Fungicide3 Concentrate on a 7- to 14-day schedule until disease development is no longer present. To control disease already present, apply Garden Safe Brand Fungicide3 Concentrate on a 7-day schedule until disease pressure is eliminated. Then continue spraying on a 14-day schedule to prevent the disease from recurring. To prevent rust leaf spot diseases, anthracnose and scab, begin applications at the first sign of spring budding. To prevent powdery mildew, apply in midsummer or when disease is first detected. Continue applications until disease pressure no longer exists. Garden Safe Brand Fungicide3 Concentrate may be used on all turf such as Kentucky bluegrass, perennial ryegrass, turf type tall fescue, Bermuda grass, zoysiagrass and St. Augustine grass around the home. Refer to table for detailed application rates. Application Instructions: Apply Garden Safe Brand Fungicide3 Concentrate at first sign of insects/mites. For control of aphids, spider mites, scale, whiteflies, beetles, leafrollers and other insect pests. Garden Safe Brand Fungicide3 Concentrate is most effective when applied every 7 to 14 days. For heavy insect populations, spray on a 7-day schedule. Spray until wet to control insects, fungus and mites. Walk at a steady pace, working back toward the faucet while spraying, using an even sweeping motion, slightly overlapping treated areas. Pesticide Storage: Keep in original container. Store away from direct sunlight, feed or foodstuffs. Keep container tightly sealed when not in use. Keep from freezing. CAUTION. Harmful if absorbed through the skin. Causes moderate eye irritation. Avoid contact with skin, eyes or clothing. Wash thoroughly with soap and water after handling and before eating, drinking, chewing gum or using tobacco. Remove and wash contaminated clothing before reuse. Call a poison control center or doctor for treatment advice. Have the product container or label with you when calling a poison control center or doctor, or going for treatment. Do not apply directly to water. Do not contaminate water when disposing of equipment washwaters or rinsate. To protect the environment, do not allow pesticide to enter or run off into storm drains, drainage ditches, gutters or surface waters. Applying this product in calm weather when rain is not predicted for the next 24 hours will help to ensure that wind or rain does not blow or wash pesticide off treatment area. Rinsing application equipment over the treated area will help avoid runoff to water bodies or drainage systems. This product is toxic to bees exposed to direct treatment. Do not apply this product while bees are actively visiting the treatment area.